Mark's Tickets is the best place to find tickets for Arizona Coyotes fans. Just check this page for any new events or schedule updates throughout the year. We sell tickets to every Arizona Coyotes game around the world. We know how passionate Arizona Coyotes fans can be about hockey, so we make sure to have hundreds of tickets for every game available right up until it starts. For those looking for cheap Arizona Coyotes tickets, we offer tickets starting at very low prices (many times below face value). We offer tickets in most sections of every venue that you can see Arizona Coyotes. Simply choose the city or venue that you are interested in below, and you will be able to see all of the available seats. 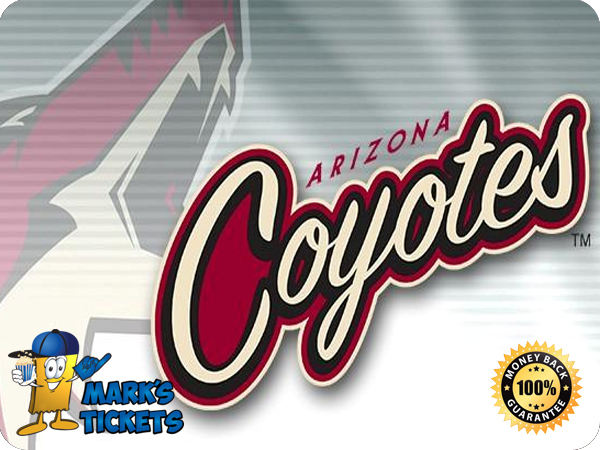 Do not forget that Marks Tickets also specializes in sold out Arizona Coyotes tickets. No longer will sold out shows prevent you from seeing Arizona Coyotes. The Phoenix Coyotes are a professional hockey team that plays in the NHL. The Coyotes play their home games at Jobing.com Arena in Glendale, Arizona. With 82 games per year, and 41 being home games, The Phoenix Coyotes are a professional ice hockey team that is based in the Phoenix suburb of Glendale, Arizona. They are members of the Pacific Division of the Western Conference of the National Hockey League (NHL). Since December 2003, the Coyotes have played their home games at Jobing.com Arena after having spent the previous 7½ seasons at America West Arena (now US Airways Center) in downtown Phoenix. The NHL took over ownership of the Phoenix Coyotes franchise in 2009 after previous owner Jerry Moyes (who had incurred massive financial losses since his purchase of the team in 2005) turned it over to the league after declaring bankruptcy. Prior to that, Moyes had previously attempted to privately sell the team to Canadian billionaire Jim Balsillie, who wanted to relocate the team to Hamilton, Ontario. but the NHL protested that the attempted sale was a violation of league policy and a court agreed. In the years that followed, the league resisted selling the team to interests that would have moved the team out of the Phoenix area, and on July 3, 2013, reached an agreement that will keep the team in Glendale for the near future and change the team's name to the Arizona Coyotes. The sale to IceArizona Acquisition Co., LLC. was completed on August 5, 2013.